Preheat the grill to medium heat, and gather your ingredients. 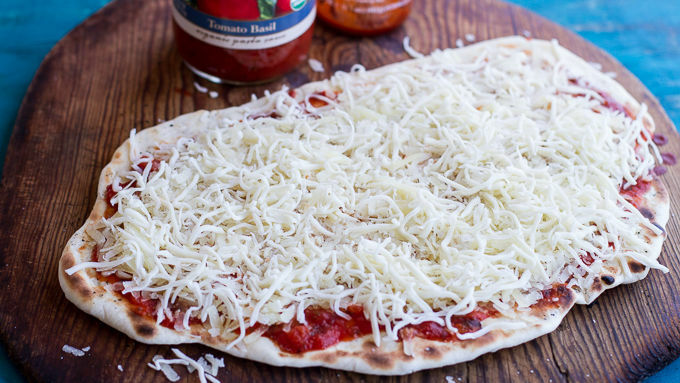 Unroll the dough onto a heavily floured cookie sheet or pizza peel. Spray the dough with cooking spray or rub olive oil over the dough. Very carefully invert the dough from the pizza peel onto the grill. Grill 2-3 minutes; flip and grill another 2 minutes. Remove crust from the grill and place back on the pizza peel or a baking sheet. 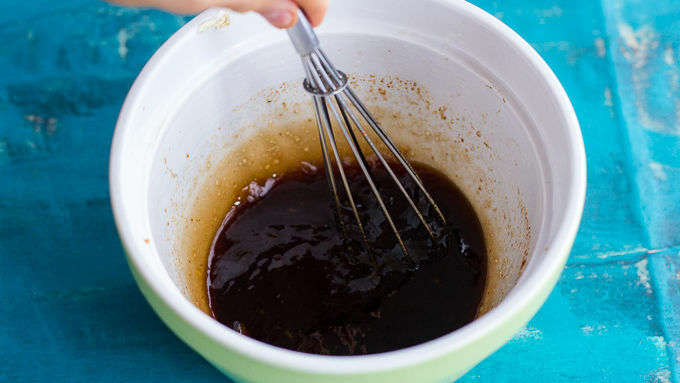 In a small saucepan combine the honey, soy sauce, orange marmalade, lime juice, and 2 tablespoons sriracha. Bring to a boil and then reduce the heat. Simmer 5 minutes or until slightly thickened. Once the sauce is thickened, remove from the heat and add the chicken. Toss well. 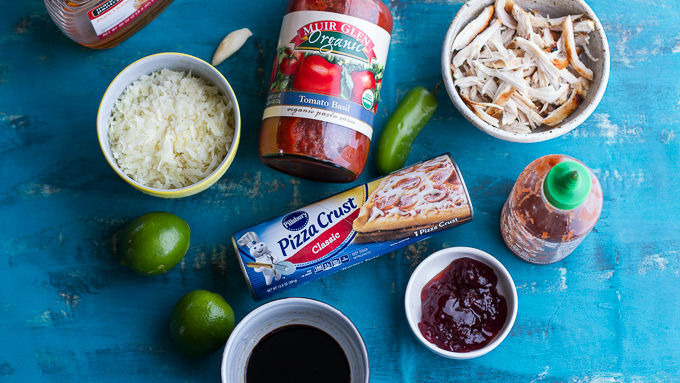 Cover the pizza in Muir Glen tomato sauce, then drizzle with sriracha to taste. Add the manchego cheese. Add the chicken mixture and all of the sauce that may be left in the pot. Add the crumbled bacon and mozzarella over the top. 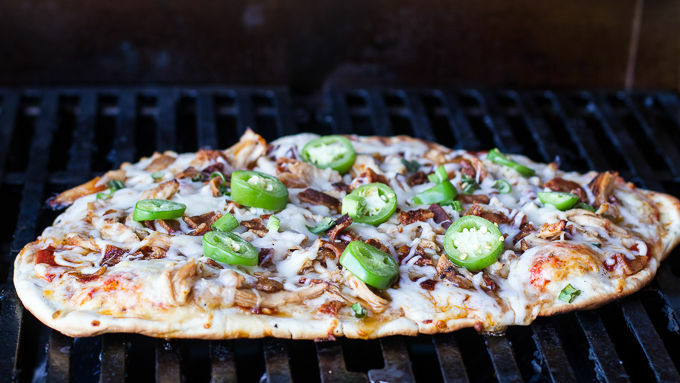 Carefully slide the pizza back on the grill. Close grill cover and cook over low-medium heat for 5-8 minutes, or until the cheese is melted. Remove from the grill, slice and eat immediately. To avoid burning the pizza crust on the grill, keep the heat no higher than medium. 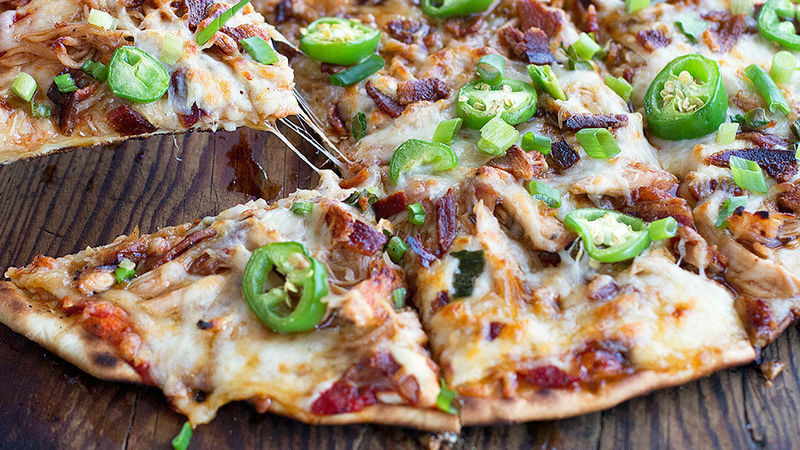 It's easy to grill up a pizza in minutes, and this one with honey and sriracha chicken is truly delicious. I have wanted to try grilling a pizza for what feels like forever. Since I have pretty much grilled everything else, I haven’t a clue why it has taken me this long to throw a little pizza dough on the grill. Whatever the reason, this was my very first grilled pizza. It will definitely not be my last! 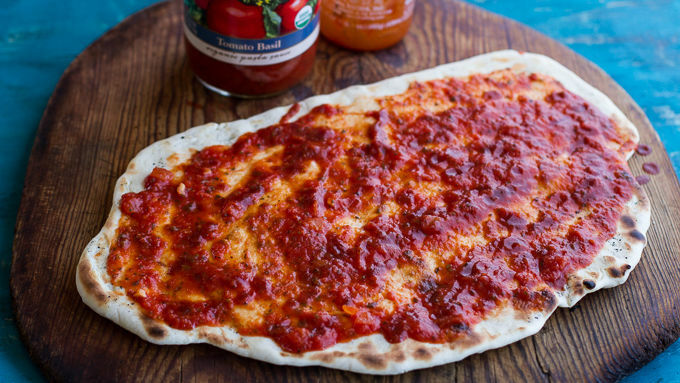 For one, grilled pizzas require no oven, which means your house stays cool. That alone should be reason enough to give grilling a try. Two, the taste is incredible. Grilled pizzas taste so much like real wood-fired Italian pizzas, but without the expense of a high-priced pizza oven. Score! In addition, can we talk about the flavors going on? Oh my gosh, honey, sriracha and manchego cheese. SO GOOD.